If you’ve got parents who can pay your college costs out of pocket, that’s awesome. But if you’re like most students, your parents can’t afford to foot the whole bill for your college costs and you’re reliant on scholarships, grants and student loans to get by. If this is the case and you’re borrowing to pay for school, it’s a great idea to take advantage of your time off school to make it more affordable in the long run. Student loans feel like nothing right now because you’re in school mode, not real-world repayment mode. But once you’re out of school and facing a pile of educational debt, you may have wished you’d been more prudent when it came to paying for school. But it’s okay! There’s still time to make a dent in your debt and graduate owing less. Making the most of your summers can be a big help. #1 Rethink Beach Time – You’d love to spend your summer at the beach soaking up rays so you come back tan in the fall, right? But instead of lying around gathering sand in your nooks and crannies, consider finding a job near the beach instead of loafing on it. You can still get your bronze on, but can also tuck away money to help pay for school in the fall. By plowing your summer earnings into fall textbooks or tuition, you can reduce the amount of your student loans! #2 Go on a Scavenger Hunt – No, not a real one, although those are great fun. Instead, devote a chunk of your time off to scouring the internet and your school financial aid office for scholarships. Millions of scholarship dollars go untapped each year simply because qualified applicants don’t apply. Even a scholarship worth just a few hundred dollars is worth applying for – any money you can get someone to give you for free translates to less you have to borrow and pay back with interest! #3 Ditch Your Campus Digs – Spend some of your summer looking for affordable off-campus housing. 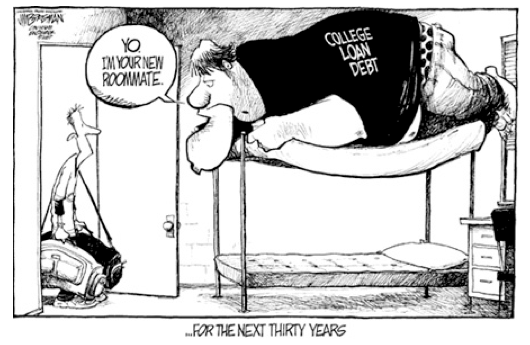 Room and board on college campuses are increasing at rates faster than tuition is climbing. By calling it quits on campus housing, you can save thousands of dollars that will translate into lower student loans later. Once you move off-campus, you can also ditch the cafeteria meal plan that costs way more than springing for pizza and ramen in your new digs. #4 Head Back Early and Scope a Job –I saw a recent study that said students spend eight hours per week studying but over half their time partying and socializing. This sounds great now, but when you graduate owing tons in student loans, life will not be much of a party. So, get a job! Once school starts, there will be a ton of people vying for open posts, so head back a week early to have the best chance of snagging a prime position. Devote that cash to textbooks, living expenses or tuition to avoid excess borrowing. #5 Cozy Up to Mom and Dad – If your parents live within commuting distance of college, consider staying with them beyond the summer. This will save you big on expenses and encourage better study habits. They’ll be glad to have you home and there’s a good chance you won’t have to wash a load of laundry until you graduate! Even if it cramps your style a little now, you’ll be better able to afford your own place after you graduate because you won’t be overwhelmed with student loan debt. If this wasn’t quite what you had in mind for your summer break, consider this – most students graduate owing close to $30,000 in student loans! Saddled with this amount of debt, more than 50% of grads have to move back home. Nearly 54% of young adults with Bachelor’s degrees are unemployed or working at low-skill jobs because they can’t find work in their field. If you can sacrifice now in order to borrow less, you have a much greater chance at financial stability in the future. You can still have a great summer, no matter if you’re working, scholarship surfing or making nice with mom and dad. And while you wait for the sunny season to roll around, if you’re borrowing to pay for school, try Tuition.io’s free student loan management and optimization tool! Rachel Rowan is a personal finance expert and blogger. As someone who graduated with tons of student loan debt herself, she knows all about college affordability issues.